One of my friends had a beautiful baby boy (to match her adorable little girl ;)), and I wanted to bring some dinner so she could avoid cooking dinner when I went to see them. However, I knew it couldn’t be anything spicy so I made two versions of these – one of us, the “original” recipe, and an altered version for them that I made up based on the original recipe that I took with some homemade mac and cheese! It thankfully appeared to turn out well, because her two year old apparently loved them so she asked for the recipe. We demolished our version, so overall I would say this recipe is a keeper. I particularly love the idea of making some to freeze…if they would ever last long enough to do so! Preheat oven to 425 degrees. Line a cooking sheet with a piece of parchment paper. In a large bowl, mix all the ingredients up to the flour tortillas together. Place a couple tablespoons of the filling about an inch up from the bottom end of a tortilla, and roll it up as tightly as possible. 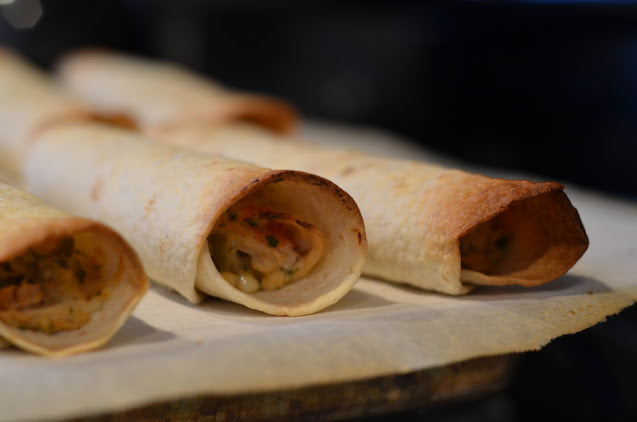 Place the rolled tortillas, seam side down on a baking sheet; you don’t want the taquitos to be touching each other. Spray the top of the tortillas lightly with cooking spray and sprinkle with kosher salt. Bake at 425 degrees for 15 – 20 minutes or until the tops of the tortillas become golden brown. At this point, you can refrigerate the mixture if you’re doing these in advance. If you’re using corn tortillas, working with a few tortillas at a time. Heat them in the microwave between two paper towels until they are soft enough to roll (about 20 – 30 seconds). Place the rolled tortilla seam side down on the baking sheet, making sure the taquitos are not touching each other. Spray the tops lightly with cooking spray and sprinkle with kosher salt.